The former CEO of Stargate Worlds studio Cheyenne Mountain is facing fresh accusations of malfeasant shenanigans. Remember Stargate Worlds? A couple of years ago, after one of the most remarkably valiant and futile struggles for survival in recent videogame memory, it finally collapsed in an ugly mess of accusations, recriminations, unpaid salaries and lawsuits. 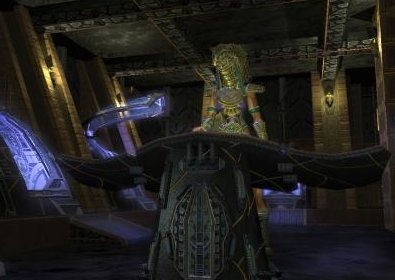 The final, strangled gurgling noise came out of the company in November 2010, when a court ordered former employees who had scooped computers and other assets in an attempt to resurrect the game to return them to original developer Cheyenne Mountain Entertainment, even though its Stargate license had already expired. At the time, CME CEO Gary Whiting expressed hope that a new deal with IP owner MGM could be negotiated, although that effort went nowhere. But even though it's been awhile since the wheels came off, a new lawsuit has been filed against Whiting and "other former Cheyenne Mountain executives, board members and stock promoters," accusing them of misleading investors. The lawsuit states that Whiting presented companies he owned as independent investors, told potential investors that the game was nearly finished and that an IPO was imminent, and took millions of dollars from the company and through loans from investors and never repaid any of it. Whiting denies the accusations but Keith Bierman of MCA Financial Group, which was appointed by the courts to handle Cheyenne Mountain's bankruptcy, said company documents indicate that millions of dollars in investments weren't actually used in the development of Stargate Worlds and may actually still be held by Whiting and other former executives. He's now seeking permission from the courts to dig into the location of the missing money in hopes of returning it to investors. MCA Financial was originally brought in to try to save the game, but MGM opted not to renew the license, forcing the company to liquidate its assets. "The had essentially lost confidence in the company's ability to deliver the product," Bierman told AZCentral. "They just didn't want to be associated with it, frankly."